MEDIUM 15.5 x 21 in. (393 x 530 mm) 18 x 24 in. LARGE 21 x 28.5 in. (725 x 530 mm) 24 x 32 in. This 'Merit Field' (Tib. 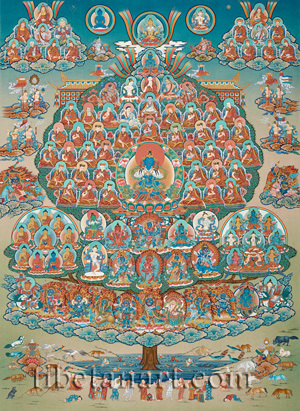 shog-shing) thangka was painted by Dorje Tamang in 2006, and shows the 'Primordial Buddha' Vajradhara seated at the centre of the Karma Kagyu Refuge Tree, with the main lineage holders of this tradition in the upper canopy of the tree, its principal meditational deities in the lower branches, and its main protective deities on the row of clouds beneath the tree. Vajradhara is the progenitor of all the tantric transmissions of the Kagyu tradition. He is deep blue in colour, holds a vajra and bell in his crossed hands, is adorned with the thirteen silk and jeweled ornaments, and sits in vajra-posture upon a white moon, multicoloured lotus, and lion-throne. A smaller image of Vajradhara appears at the apex of the tree, representing the source of the lineage of Indian and Tibetan gurus that descend below him. These include: Nagarjuna, Ratnamati and Saraha; Marpa, Milarepa and Gampopa, and the first three Karmapas' - Dusum Khyenpa, Karma Pakshi and Rangjung Dorje - all of whom appear in the three central columns. The fourth to the sixteen Karmapas also appear wearing their black hats in this assembly, along with the various red hat incarnations of the Sharmapa, Tai Situ and Gyaltsap Rinpoche, and the first two incarnations of Jamyang Kongtrul. Appearing in the three rainbow circles above the tree are Prajnaparamita (centre), Samantabhadra (left), and Vajrasattva (right), with the Indian mahasiddhas Tilopa and Naropa on the clouds below. On the clouds in the upper corners appear lineage masters from other traditions, with Padampa Sangye at the centre of the left cloud, and Ling Repa at the centre of the right cloud. The roofed stacks of books behind the tree represent the profound dharma teachings of the Kagyu tradition, with eight cloud-borne gods appearing on either side holding auspicious offerings. And on the left and right clouds beneath these gods are the great male and female protectors, Kshetrapala (Zhing-zhong), and Shri Devi (Paldan Lhamo). On the central branch below Vajradhara are ten of the principal meditational or yidam deities of the Karma Kagyu tradition. From left to right on the upper row: Green Tara, Jinasagara, Chakrasamvara and Vajravarahi (centre), Guhyasamaja-Vajradhara, and White Tara. And on the lower row are: Machig Labdron, Hevajra, Vajravarahi (centre), Kalachakra, and Vajrabhairava (Yama). Encircled by a rainbow on the left branch are a group of ten Buddhas that represent the ten directions, and the Buddhas of the three times. Shakyamuni sits at the centre of this circle, with red Amitabha Buddha and the blue Medicine Buddha seated to his lower left and right. And within the rainbow circle on the right branch are the eight great Bodhisattvas, with Avalokiteshvara at the centre and the Buddha's two principal disciples, Shariputra and Maudgalyayana, seated in front of him. Eleven protective deities appear on the row of clouds beneath the tree, with Dorje Bernagchen, the principle protector of the Karma Kagyu tradition, at the centre. The trunk of the great Refuge Tree arises from a lotus-lake, which is surrounded by a meadow filled with a multitude of animals, birds, monks and lay devotees, who make prostrations and present offerings to the divine assembly of the Refuge Tree. And on the lower cloudbanks are assemblies of the eight auspicious symbols (left), and the eight auspicious substances (right).